We are delighted to pair with Consulting Room on this exciting new blog series which we hope will guide you through your hair loss journey. To start, we discuss the basics of hair, in a healthy state, laying an important foundation to our understanding of hair loss itself. Many hours and lots of money are spent making sure we have hair in some places and no hair in others. We see hair depicted beautifully in magazines, films and social media; but what happens when we swap the camera for a digital microscope? We see a more curious landscape, which looks a little like waves crashing against jagged rocks. Maybe this abstract visualisation isn’t the best, but we can appreciate that hair is complex and that’s an important start. 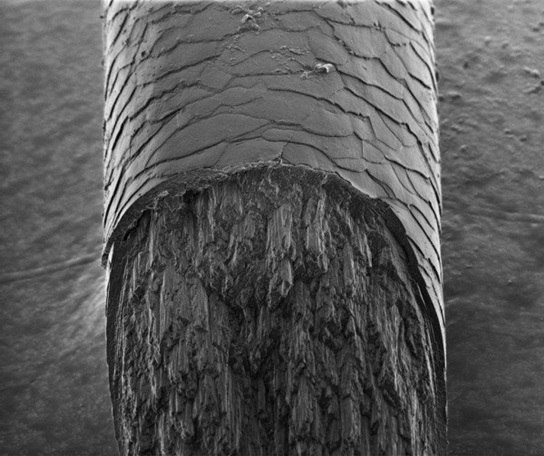 A human hair magnified by 2500x using an electron microscope. The hair we see and style, also known as the hair shaft, is one part of an intricate structure which starts deep in the dermal layer of the skin. 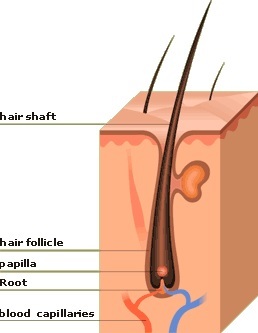 The shaft grows out from the root, which is also known as the hair follicle. Each of these parts provide important functions of hair. As hair grows out from the scalp, newer hair is seen closer to the skin. As we look along the length of the hair shaft, we see a timeline showing how hair has been washed, oiled, dyed, exposed to excessive heat and damaged. It becomes clear that hair undergoes a great deal of stress in its life and knowing what makes up the hair shaft helps us understand what is required to protect it. The Cuticle – These are the waves that we see under the microscope. A thin layer of cells which slide over each other, almost like tiles on a roof. In the same way, these ‘tiles’ stop harmful chemicals entering the hair shaft and consequently keep them healthy. They also provide protection from outside forces such as bending, combing and blow drying. In thick hair types, there can be six layers of cuticular cells, whereas thin hair may only have two layers. This shows how certain hair types may be more prone to chemical and physical damage than others. The Cortex – These are the rocks that we see under the microscope. This layer is formed of cylindrical bundles of keratin which arrange itself into columns providing the hair with strength. A healthy head of hair is strong enough to hang 12 tonnes from it- that’s two fully grown elephants! (2) Ensuring these structures remain strong and well hydrated is the key to maintaining healthy hair. Natural oils produced at the base of the hair, run down the shaft to coat the cuticle layer. This provides a barrier which helps the cortex retain water. In straight hair these natural oils find their way along the hair with ease allowing it to stay healthy and hydrated, however, in curly hair the oils find it difficult to move along the shaft leaving it exposed to become dry and eventually damaged. This is the growth centre of hair. At the root, a complex group of cells come together to construct the hair shaft giving it colour, thickness, texture and sebum which is the natural oil that coats our hair. The hair follicle contains its own blood supply which provides nutrients needed for hair formation but also exposes it to hormones and chemicals which can influence the growth of hair as explained below. Anagen phase (approximately 80-90% of hair) – This involves a good blood supply to the follicle allowing for active growth of the hair shaft by approximately 1cm every 28 days. In a healthy state this phase lasts up to 7 years. Catagen phase (approximately 1-2% of hair) – During this short phase lasting only 2-3 weeks we see the blood supply to the follicle shut off, preventing healthy growth and producing thin wispy hair. Telogen phase (approximately 10-15% of hair) – Having lost its blood supply, the hair shaft is shed, and the remaining follicle remains dormant for up to three months. This explains the one hundred or so hairs we lose in a single day as part of normal hair shedding. In a healthy state, the bloody supply will reconnect to the hair follicle and re-enter the growth (anagen) phase. In our next blog, we explore what happens when these healthy states of hair growth undergo internal changes resulting in thinning and hair loss.